Mow entire lawn to be sprayed. Apply this product in the morning or evening one hour before sundown before heavy rainfall. Or water in thoroughly after applying if not rainfall. Use when organic matter/fertility levels are low in the soil. Check fertility level in the soil after a month. Best to keep soil moist and cool especially in the hot summer months, as your soil fertility increases. For pump sprayers, hose end sprayers, electric, or industrial spray tanks. Important: Figure how our many square feet your sprayer covers before mixing. Most pump sprayers average aprox 1,000 square feet per gallon but could vary. If 1,000sf you will need 2 ounces measured (not weighed) of concentrated powder mixed in water . 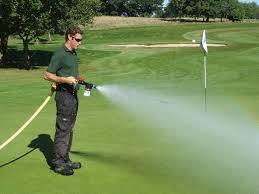 If using a pump sprayer, be sure to water in thoroughly after applying to get product in the soil. For Hose End Sprayer you usually get 2-2500sf sprayed before container empties, but could vary. Which would require at least 4 ounces measured (not weighed) mixed with water in hose end container. Spray lawn until empty. Can also mix hydro- lr in a bucket of water and fill your hose end container and sprayer until empty, but be sure you have enough hydro-lr for the square footage and water mixed in your bucket to accommodate for the quanity of loads it will take when filling your hose end container . Does not matter how you apply this product, just get it in the soil at 2 ounces measured per 1,000sf. What ever method you figure that is easiest. If using on plants click here. Storage: Store Sure Green Hydro-LR in a cool dark place. Storage life is aprox 2-5 years. While mixing, do not get in eyes, may cause irritation, although product is mild, low dust if any, if this happens, flush eyes with water. wear glasses.